If you have your cup out and you are sitting waiting for people to drop some change, or bills if you are lucky, I’m pretty sure you are sabatoging your plan by taking out your cell phone. Number 1: If you are texting and panhandling, you shouldn’t be panhandling. I can’t believe I even had to say that. Number 2: Even if you are pretending to text or having a fake conversation; even if you have no service, you know you can take that phone in for some cash right? Do you know how many times I’ve seen homeless people on their phones? Too many. Do you know how many times I had given change to those people in the past? A lot. No more obviously. In recent years I have chosen to buy food for people instead, which I’m sure many people do. Seems like a better idea, right? Usually… but I have some stories about that too. I’ll save those for another day. 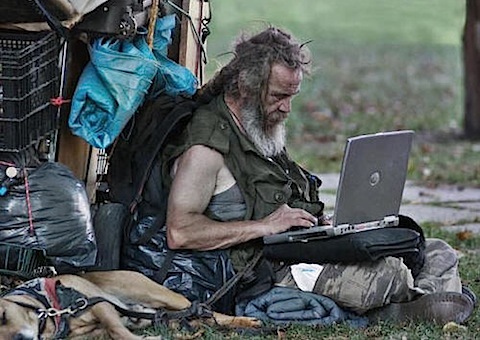 OMG, I was just thinking the same thing about the SD “homeless.” Some of them look cleaner than me after a whole day. LOL!! I suspect they aren’t homeless as such, but living in poverty. I use to work with this demographic and just can’t anymore because of reasons people can’t fathom. I can’t even imagine some stories of family abandonment or mental health issues. Must be heart breaking to work with this population. Although some people – I don’t buy it. Particularly 20 year olds that claim to have no home, yet appear very able-bodied and coherent. Hmmmmm..
One day this an came up to me and asked me for some money because he was hungry. I said I would buy him a Mac hamburger and a drink but that would be all, because I don’t have much money. He agreed and I bought him a plain cheese burger and a small pop. He was satisfied.